Happy Holidays Project Run and Play readers! 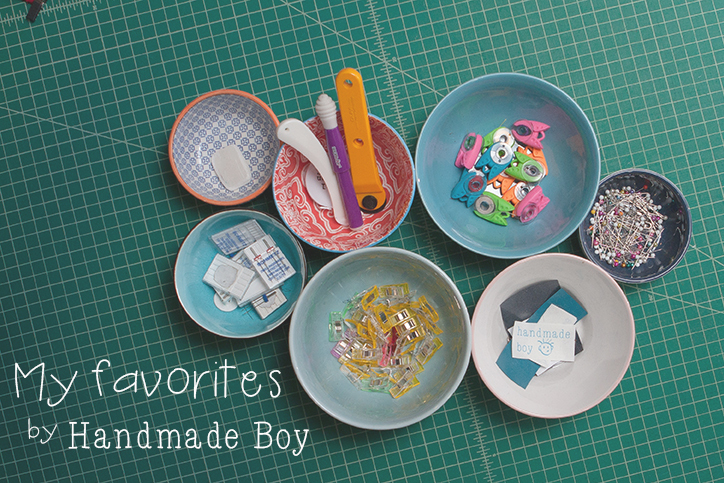 It's Kelly here from Handmade Boy and I'm so excited to share with you my favorite little things that make sewing fun for me. I absolutely adore pretty ceramic bowls! They are so great for holding my favorite things while making my space look nice. They make it crazy easy to just toss things into their proper spot to stay organized. And they sit nicely on my cutting table but are also easy to take with me to the sewing machine or ironing board as I work. 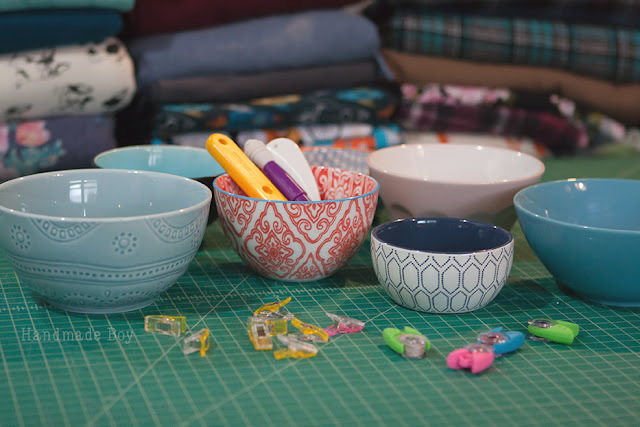 Some of my favorite supplies are kept in those bowls! I love wonder clips for holding hems in place or to clip paper pattern pieces to my cut out fabric so I can keep track of what I have already cut out when preparing a pattern. This also keeps my pattern close by so I can double check that I marked all markings! 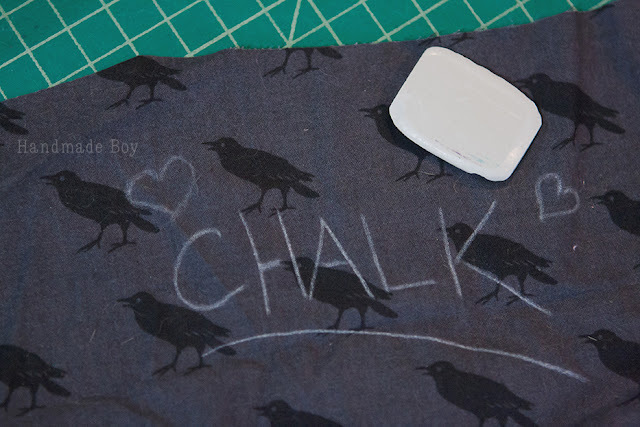 And on that note, I love traditional tailor's chalk for marking. It always works, never fades before I need it to, doesn't come off if I accidentally iron over it, and always washes away when I'm done. I have blue and white for light and dark fabrics. I am a big fan of these fun little Tulips Bobbin Clamps for keeping my bobbins nice and organized. 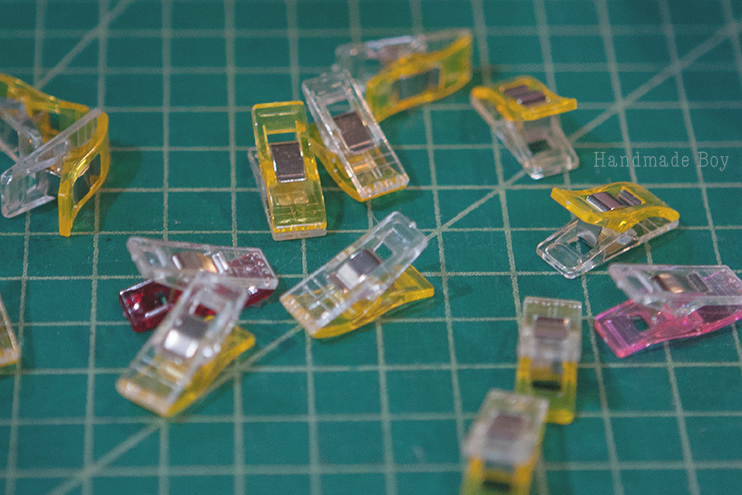 They are easy to use and fit on bobbins of any size. You can keep them strung together on the little chain that comes with them, or toss them in a bowl for easy access, like I do. 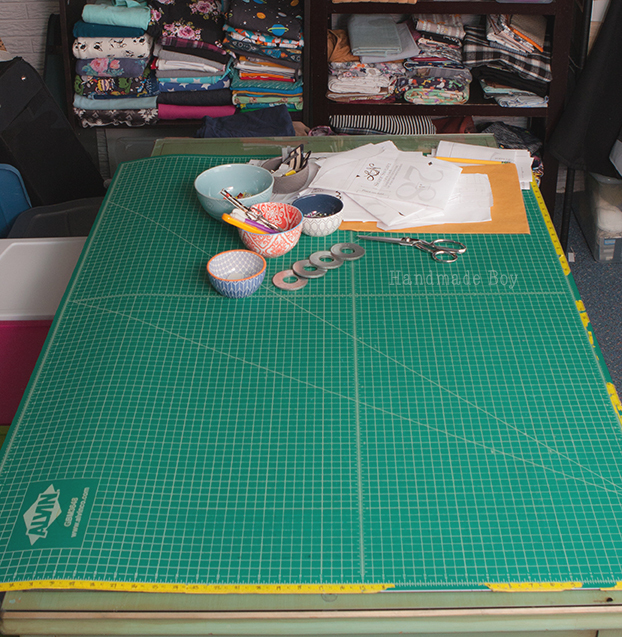 Something that has really made the process of preparing to sew so much nicer is my HUGE cutting mat. This baby is so nice for cutting out things like pajama pants for myself and my older kids. Oh yeah! I can't forget my pattern weights! See those giant washers on the cutting table? Those are my pattern weights. For just a dollar or so each from the hardware store, they are a steal! Nice and heavy, they keep my patterns in place without any shifting issues what so ever. Of course, I have favorite places to buy fabric from also! I get quite a bit from Phat Quarters Shop. 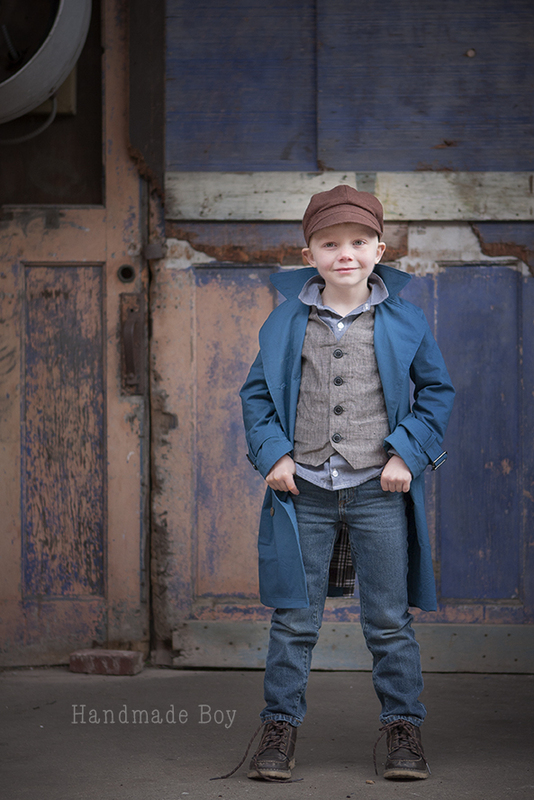 They have some great wovens for my boys' dress shirt and quilts along with a nice variety of high quality knits. Purple Seamstress and Peek-a-Boo Fabrics and where I like to get my basic cotton lycras and French terry. Raspberry Creek and Sincerely Rylee have the floral French terry that my teen and I love. And Mabel Madison has some fun Euro prints. All of these shops have the best customer service and crazy fast shipping! All of these great tools have made creating some of my favorite things so much easier. One is this outfit I made for Thomas for CraftingCon's Everyday Steampunk month. It was such a fun look to create! 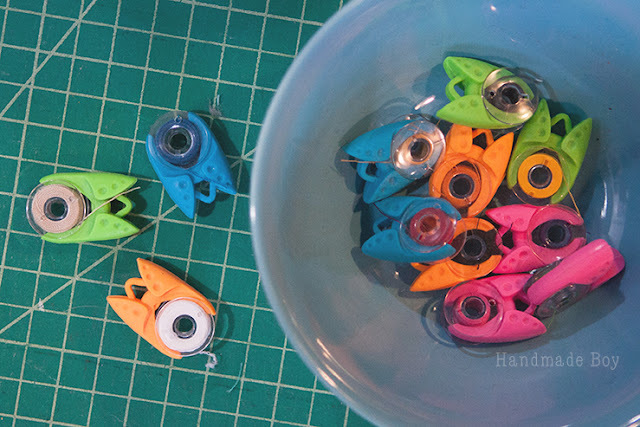 Thank you so much for letting me share some of my favorite sewing tools! I hope they can make sewing even more fun for you! If you would like to see more of the spectacular Kelly, visit her over at Handmade Boy, and on Instagram, Facebook, and Pinterest.